Heat the oil in an approx. 30cms dia. frying pan, ideally a "paella pan" (Moore Wilson e.g.). Add the garlic and fry on a medium fire for a minute. Add the "Pimentón de la Vera" and the rest of the ingredients for the "sofrito" but the wine, and stir for 5 min. 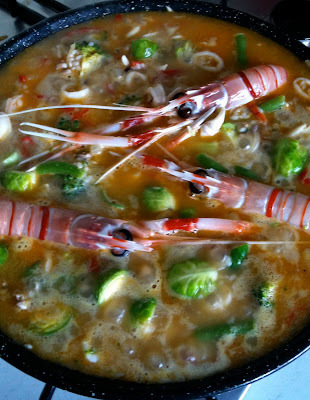 Pour the wine and stir until the liquid has evaporated, then add the crayfish but reserve the scampi, stir for a minute. Add the vegetables and the rice and mix well. Add half of the hot water and the seasoning and mix well for the last time, shake the pan a bit to make the surface even. 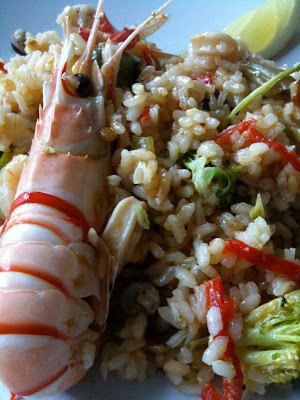 Now place the scampi nicely lying over the rice and pour the rest of the boiling water all over. Cook on a medium fire until the water is evaporated, the rice should be cooked. Oh My God. It looks define. What do you do after you have finished the recipies? I mean, who eats all this gorgeous food? If you ever need ginnie pigs to try recipies out on... I'm happy to be of service. Sergio is my guinea pig at the moment but I'll think about it.